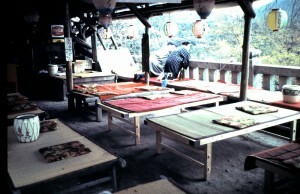 When I lived in Asia, I just loved dining al fresco. There was something about a sub-tropical climate that lent itself more to dining outdoors than somewhere like Chicago, where I live now. So my heart skipped a beat when I found this slide among dozens my mom took at the Kiyomizudera Buddhist temple in Kyoto. The lanterns, the beautiful view, the pretty tables. I can almost smell the roasted rice in pot of genmaichai. Mmm. And then I looked closer at this image. The ground is a dusty layer or two of gravel. 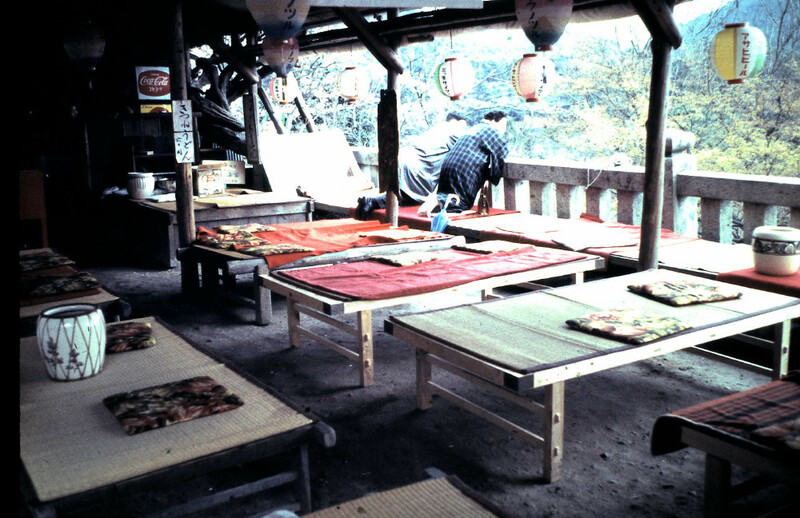 That must have been tough on the dresses or kimono women wore back then, even with the colorful cushions they could place on the ground to kneel upon.